captured on the 27th and 28th of December respectively. Credit: NASA. It is now well established that we are in the midst of the strongest El Niño event in nearly two full decades, which we last witnessed with the record-breaking 1997/1998 El Niño. Most of the folks on the U.S. West Coast, especially in Southern California and the Sierra Nevada mountains, associate strong El Niño events with abundant precipitation from an enhanced subtropical jet stream. Strong El Niño events, such as 1997/1998 and 1982/1983, have historically set the bar in bringing at least twice the amount of precipitation as compared to normal fall and winter seasons, with winter historically proving to be the most abundant. 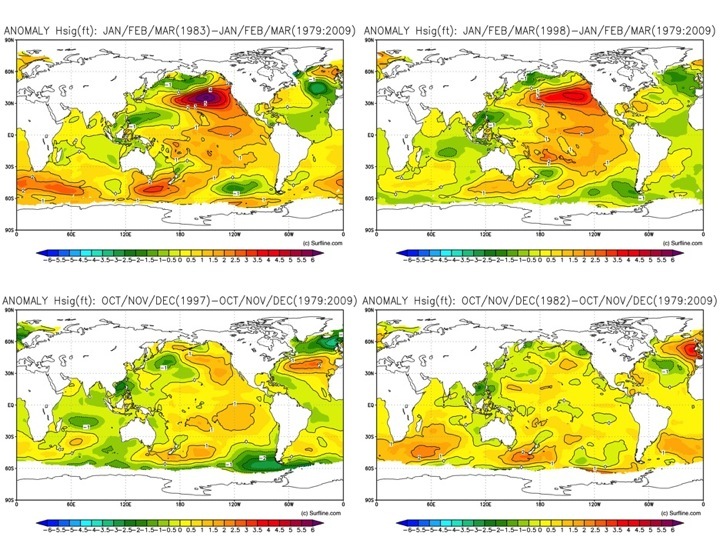 The latest comparison of the 1997/1998 El Niño to the current El Niño produced by NASA depicting the changes in sea surface height anomaly, a proxy for ocean heat content and temperature, is shown in Figure 1. For more information on the forcing mechanisms which led to the development of the present 2015/2016 El Niño, please refer to our previous story, "El Niño Watch: A Comparison of Current Conditions with Past Events." Visit the Jet Propulsion Laboratory's Center for Climate Sciences for current El Niño observations from various NASA Earth observing satellites. What most people don’t typically think about however are the recreational benefits that are reaped from strong El Niño events, namely when it comes to snow sports, but also when it comes to surfing. The last two major El Niño events, 1982/1983 and 1997/1998, have both proven to be record breaking years in producing some of the strongest North Pacific fall and winter storms that have brought the largest and most consistent surf to the U.S. West Coast. In a previous story we published on surf forecasting using satellite remote sensing data, "Waves and Satellites: Chasing the Big Ones", we reviewed the forcing mechanisms at work in producing some of the largest waves on the planet. The most important forcing mechanism is wind, and the second is fetch (representing the continuous, unimpeded distance over which the wind is felt by the ocean). Fetch is a function of distance, but it’s also a function of a storm’s horizontal coverage area and translational velocity. Slow and steady moving storms (i.e., low translational velocity) with a large coverage area will provide steady winds over a larger fetch when compared to rapidly transitioning and fast-moving storms. Such storms that produce very strong winds (i.e., greater than 25 m/s) over a very long fetch (i.e., greater than 1000 km) have the potential to generate large waves with enough energy to travel across the ocean basins for distances on the order of ten thousand kilometers (e.g., the distance between New Zealand and Los Angeles). Patton. 2) Surfline/Wavetrak Inc. Copyright 2015. Historically, the 1982/1983 and 1997/1998 El Niño events represent textbook cases of how wave heights in the North Pacific and surf heights along U.S. West Coast beaches were much higher and more consistent than average. These strong El Niño events provided the subtropical fuel needed to create a steady source of baroclinic instability (i.e., when strong horizontal temperature gradients intersect with strong pressure gradients), which facilitates persistent convective energy (i.e., exchange of warm and cold air masses that lead to winds, clouds, and weather) over much of the Central and North Pacific. Both these past and present El Niño events have contributed to convective energy that has been observed to propagate all the way into the interior of the U.S. and as far as the U.S. East Coast, particularly affecting regions along the coastlines of the Gulf of Mexico. Greater baroclinic instability coupled with persistent convective energy during a strong winter El Niño means both a higher frequency and a higher intensity of storms, thus translating to a relatively rare and epic time where one can observe some of the largest and most consistent surf observed in the North Pacific region. the event. 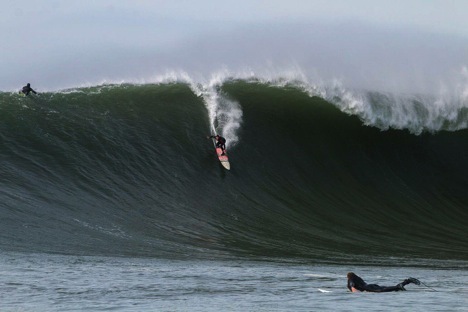 Credit: Jeremiah Klein, Surfline/Wavetrak Inc. Copyright 2016. What makes El Niño storms unique is their very close proximity to the U.S. West Coast, which allows the bulk of the wave energy to concentrate on a relatively close coastal boundary at the edge of the fetch, thus maximizing the height of the wave once it reaches the coast. Furthermore, El Niño storms typically follow a more zonal (West to East) direction that is driven more by sub-tropical atmospheric flow in contrast to the traditional sub-polar low pressure systems that originate in much higher latitudes (e.g., Aleutian Islands of Alaska) and propagate to the lower mid-latitude portions of North America. From what we’ve already seen in the aftermath of early January 2016 storms (e.g., Figure 2 and Figure 3), this current El Niño is proving to be no exception at having the storm producing potential required to deliver some of the largest surf the U.S. West Coast has seen in nearly two decades. 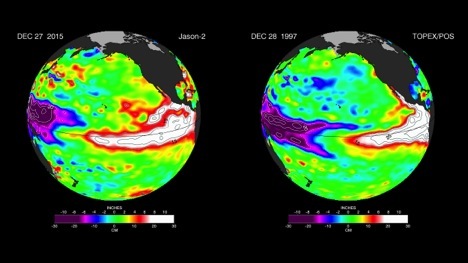 From an an analysis done by Surfline, the prediction is for a strong El Niño to last through the 2016 winter, which is supported by NOAA’s Climate Prediction Center (CPC) who expects the El Niño to gradually begin to weaken during the spring with the likelihood of becoming ENSO-neutral by summer. 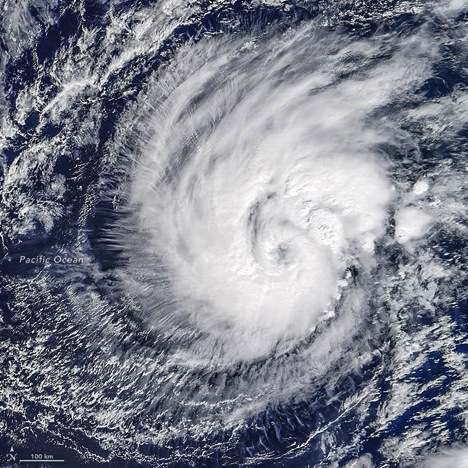 For more on the latest El Niño Surfline story, please visit: http://www.surfline.com/surf-news/surfline-el-nio-update-january-19-2015_134901/. sustained winds of 45 m/s (100 mi/hr) the next day. Credit: NASA, Jeff Schmaltz, LANCE/EOSDIS Rapid Response. Surfline has been closely studying and following the impact of El Niño events on the general surf climate for the North Pacific using global wave forecast models that assimilate satellite data, such as ocean vector winds and wave height observations (see "Waves and Satellites: Chasing the Big Ones" for more information). During the two previous events observed in the winter of 1983 and 1998, the entire North Pacific experienced notably higher significant wave heights, with averages up by 3 to 7 feet above normal (Figure 5). Comparing these to anomaly measurements in the 3 months prior, (Figure 5) it is noticeable that there is little to no increase in Significant Wave Heights during the lead up to the event. 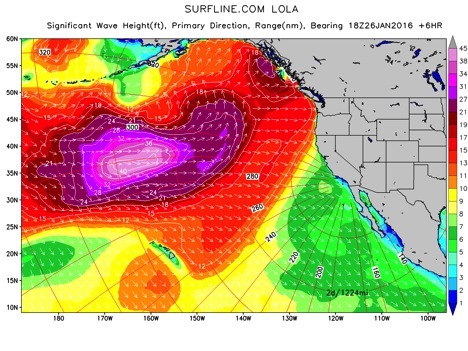 This anomaly translates to increased size and quality of surf in Hawaii and on the entire U.S. West Coast. So far in January 2016, the North Pacific has seen a back to back stream of large, swell-producing storms traveling from West to East. February looks to be no different based on long range forecast models. In conclusion, based on historical comparisons between averages and El Niño months during the 1997/1998 and 1982/1983 events (e.g., Figure 5) and the conditions at present (Figure 6), surfers across the Pacific are in for a good to epic year in 2016.
the same time period. 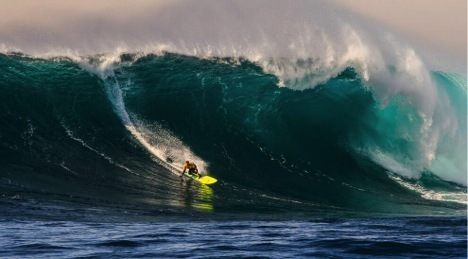 Credit: Surfline.com. forecasts are closely matching the anomaly conditions.